Like Venice, Paris has always been a magnet for lovers and their affairs. As Woody Allen put it: "As long as you haven't been kissed during any of those rainy Parisian afternoons, you haven't been kissed at all." Paris is where sleepy marriages are rekindled, the flames of passion ignited, vows renewed, and special someones met. But where will you get the most ardent thrill? I will start with an obvious spot: the sidewalk cafe terrace. There are thousands of such in Paris, and lovebirds are a common sight there. The cafe terrace is an enjoyable spot in more than one way. First, they offer a nice resting spot. Second, they make an ideal observatory. The streets become an aquarium, passer-bys are the fish, and you two become the observers. Third, sit down at a terrace where other couples are smooching, and you are part of a community setting a good example to the rest of the world. For all we need is love! One of my favorite cafes is 'Les Chevaux de Marly', inside the Louvre Museum, facing the wing where the Da Vinci Code movie was filmed. Les Chevaux de Marly isn't your typical sidewalk cafes; the place reeks history, and even when you sit outside you are well protected against the elements thanks to the stone parapet. Now if you are a die-hard fan of the Latin Quarter, and the St Germain des Pres area, you will certainly want to sit at the terrace of 'Les Deux Magots' (A Pair of Old Bachelors). French philosopher Jean-Paul Sartre and his wife, writer Simone de Beauvoir, used to hole up there in the 50s. Rather large and well protected by a long awning, the terrace is a great spot to observe the foot traffic moving along the busy Boulevard St Germain. The atmosphere inside the cafe has kept some of its mid-20th century flavor. A tad on the expensive side, but history and a great view have a price, haven't they? More suggestions? Check out the following areas, you'll find nice cafes: 'Butte aux Cailles' (in the 13th district), 'Place de la Contrescarpe' (in the 5th district), 'Place des Abbesses' (on the Montmartre Hill), and the perennial cafe facing the Pont St Louis, on Ile St Louis, near Quai de Bourbon. I always advise my friends who take the trip to Paris to discover the city on foot. Walking is the absolute best way to enjoy sightseeing in Paris. And 'look up' must be your operative word. Don't just look at eye level: raise your eyes, and observe what's above. The 'upper floor' scenery is worth it. For romancing the love of your life, certain places have these very special qualities which will set them apart in your memories of togetherness. I will tell you about three for now, and there will be more to come. Atop my list, 'Place Furstemberg'. From the plaza of the St Germain Church, walk toward the Seine and Rue Bonaparte. Turn right into Rue de l'Abbaye. Follow the street to the first short alley on your left. Turn and you end up on 'Place Furstemberg'. French painter Eugene Delacroix had his studio there, and this makes an interesting spot to visit during daytime. But 'Place Furstemberg' takes a whole other atmosphere at night. It is quiet, isolated, and sort of private. The nearby abbey lends it a historical feel. Sitting under the trees, the wooden benches welcome eternal lovers. My second pick would be the steep flights of stairs leading up to the top of the Montmartre Hill, and the quaint streets below 'Place du Tertre'. Here again, you would be well inspired to discover the hill during the day, and come back to it in the evening. Montmartre is one of the last areas in Paris to have retained their 'olden days' feel. Strolling around the hill at night gives you a whiff of what Paris was like in the late 1800s. Most definitely one of the very best spots to roam hand in hand, stealing a kiss here and there under the quiet glow of the street lights. As a final destination for this short trip, let me take you to the park located at the tip of 'Ile de la Cite'. This is the largest of the two islands, and the small park named 'Square du Vert Galant' takes its name from King Henri the 4th, a womanizer in his own right ('Galant' alludes to his reputation as a smooth talker, and 'Vert' means the guy was 'always ready to fire'). Walk to the 'Pont Neuf' bridge, go down the flight of stairs opening behind Henri's statue, and you will wind up on the wharf. 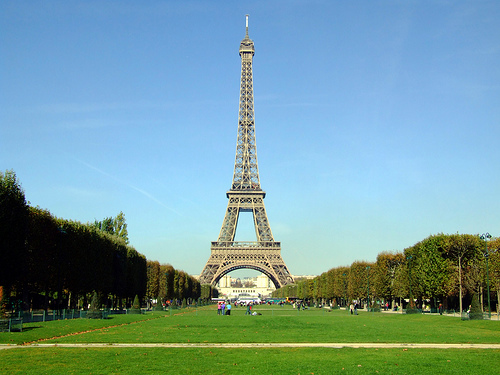 There, lined with century-old trees, the park offers a magnificent view of the river Seine and the Louvre Museum. I recommend discovering the spot together during daytime. It is also the port of call of a boat tour operator. Seize this opportunity to boat upstream and downstream. Don't forget to bring an extra sweater, the temperature at water level is chillier.